An event celebrating 25 years of running around the Canadian National Exhibition grounds, the Honda Indy of Toronto presents a generation full of great moments. In the inaugural 1986 open wheel round held on the Canadian temporary street course, Bobby Rahal claimed victory shortly after taking the year's Indy 500. For 7 of the 24 previous race runnings, Michael Andretti hoisted the Toronto race trophy. For occasions, the open wheel race in Toronto saw a Canadian challenger take the coveted race as local hero Paul Tracy won in 1993 and 2003. Sporting a rich history of exciting open wheel racing, the 2011 edition of the Honda Indy started event as 26 IZOD INDYCAR Series competitors fire up Honda V-8 racing engines. For the 25th Sunday event on the 1.755-mile street course Canadian actor Dan Ackroyd gave a bellowing command to start those engines. Taking the pole with an under-1 minute qualifying time, defending 2010 Honda Indy champion Will Power started the 2011 event on the front row with Scott Dixon alongside. With only 6 Honda Indy events won by the pole sitter, Power and the #12 Penske Racing team had their work cut out for them in efforts to repeat a victory lane appearance. Will Power's 8th consecutive road course pole in the IZOD INDYCAR Series parlayed a 33-lap initial lead at the Honda Indy Toronto as the Target Chip Ganassi Racing cars of Scott Dixon and Dario Franchitti hung close behind. As the green flag initiated the 85-lap race, the term "avoidable contact" was uttered quite often during and after the course of the 2011 Honda Indy of Toronto. At the typical problem area of the turn 3, Tony Kanaan in the #82 KV Racing Technology car became the first victim of what would be a series of on-track contact. Rushing into the turn in the third lap of the event, the #82 was being challenged on the inside of the Lakeshore Boulevard stretch by the #6 Penske Racing car of Ryan Briscoe. Bring early in the Honda Indy race, Kanaan gave Briscoe room to safely turn through the slow, tight turn 3. Despite the space presented, the #6 Dallara-Honda swung wide catching the right rear wheel of the #82 KV Racing Technology car. Spinning the #82 car into the outer wall, Tony Kanaan's day ended with severe suspension damage to his Dallara. Stepping out of his car, Kanaan immediately expressed heated displeasure to Ryan Briscoe as the #6 Penske Racing car rounded the track under caution. Used to being in contention for wins in the past month, Tony Kanaan's IZOD INDYCAR race in Toronto ended before the #82 car had a chance to mount a change. 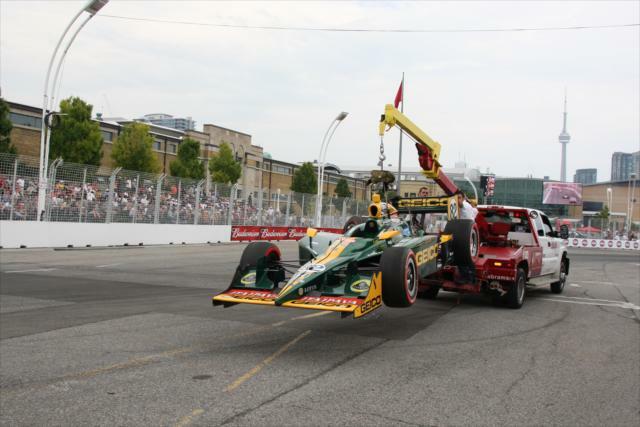 As the Honda Indy ran under a full-course yellow to retrieve Kanaan's wrecked race car, a restart on lap 6 was followed quickly by more action within the turn 3 area of the Toronto street course. Under braking entering the corner, Danica Patrick's #7 Andretti Autosport car received hard rear end contact from Takuma Sato as she braked for the turn. Calling Sato "an idiot" over her in-car radio, Patrick was able to continue back to the pit road but Takuma Sato's #5 KV Racing Technology. 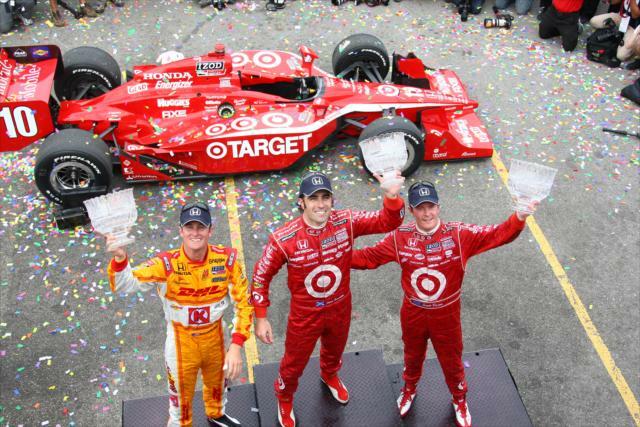 Both drivers would finish the 2011 Honda Indy but would reside 6 laps down at the end of the event. In the case of Patrick, she would also get caught in a later caution. As the #7 car would end up needing two nose cone assembly changes, Danica Patrick finished the race wearing a share front end piece from her Andretti Autosport's teammate Marco Andretti's #26 car. The first Canadian IZOD INDYCAR Series event of the 2011 season, the Honda Indy Toronto propels three drivers deeper into the race weekend spotlight. Paul Tracy, Alex Tagliani and James Hinchcliffe are provided with the additional pleasure (or perhaps burden) of competing on front of a hometown crowd. While fanfare was at an all-time high for each Canadian driver, the track results through the weekend was an effort accompanied with less than impressive qualifying runs for Sunday's event. As the race started, all three drivers began to assert themselves at the Toronto event. Starting 24th driving the #8 Dragon Racing Make a Wish Canada car, Paul Tracy charged 5 spots in the first handful of race laps. Driving his regular #77 ride for Sam Schmidt Racing, Alex Tagliani was eager to show pace early in the event. Looking good up to the first round of pit stops, Tagliani's Toronto race would quickly turn sour on lap 31 when Helio Castroneves made contact with the #77 car in turn 3. 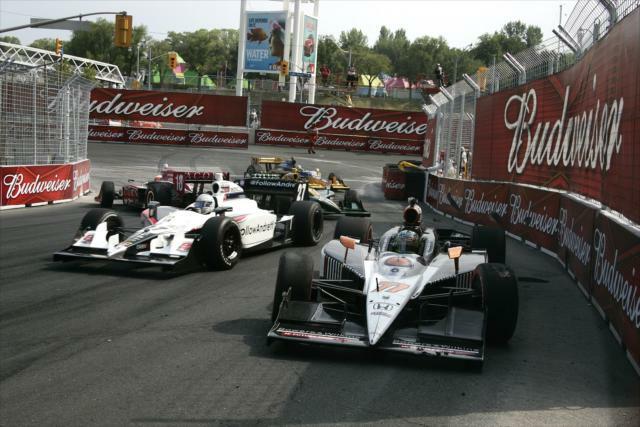 While the damage was minimal, many at the race track took note of the 2009 tangle Castroneves had for other Canadian driver Paul Tracy at the event. The contact between Helio Castroneves and Alex Tagliani brought out the race's second full course caution. In the first 1/3 stage of the Honda Indy Toronto for the IZOD INDYCAR Series, several teams deeper in the field began to short pit hoping to take advantage of a caution. Thanks to the Tagliani/Castroneves caution on lap 31, there was a chance for some to capitalize on the fact the top-three drivers Will Power, Scott Dixon and Mike Conway had no pitted. As those vehicles came to attention of pit road during the caution period, Dario Franchitti took over the race lead. On a lap 36 restart James Hinchcliffe, the rookie Canadian driver wheeling the #06 car for Newman/Haas Racing for the 2011 Honda Indy, was elevated to 5th place in the field. Attempting to retain the high track position, Hinchcliffe immediately fell under the challenge of fellow Canadian Paul Tracy. Watching the open wheel race as a spectator for almost his entire life, James Hinchcliffe would end up dicing with the heroic two-time race winner. Through turn 3 at lap 37, Tracy drew along the inside Hinchcliffe's #06 car for position. Unwilling to give up his spot, Hinchcliffe matched wits with Tracy's trademark aggression. Racing side-by-side skillfully through the tight turn 3 and 4 stretch, turn 5 would see the thrilling duke-out between the two Canadians. Out of the fifth turn of the Toronto track, Hinchcliffe's and Tracy's cars slid together. Making contact on track, Paul Tracy received the worst of the incident requiring the West Hill, Ontario native to participate in an extended time on pit road. Finishing 16th on the day, Tracy responded about his 2011 Honda Indy in post-race saying, "Today wasn't the best day for us Canadians and our team. We had a great car and made our way through the field, making it all the way to the top-five. Unfortunately, cars got in our way and ended our day early, causing us to go two laps down for the rest of the day." Through the mid-point of the Honda Indy Toronto, the on-track impacts between vehicles has grown to the point that unscheduled pit stops were common place. On lap 42, Graham Rahal limped to attention of his Service Central Chip Ganassi Racing team with a flat rear tire caused by contact with another car. Six laps later, the #28 Andretti Autosport piloted by Ryan Hunter-Reay needed to have a loose front wing replaced. Ironically, these unscheduled pit stops would provide them with a chance at the race's victory. Hunter-Reay's pit stop came shortly ahead of a turn 3 jam-up involving Paul Tracy, Victor Meira, Sebastien Bourdais and Charlie Kimball. The fourth full course caution of the race, the race would be slowed four more times in the final 28 laps. As the IZOD INDYCAR racers ran through the final stage of the event in Toronto, the race quickly evolved into a heavy contact street fight. One of the most controversial coming-togethers at the 2011 Honda Indy occurred between the top two points contenders in the series overall points. Into turn 3, Dario Franchitti dived under the #12 Penske Racing car of Will Power. Within the turn, Franchitti bumped Power's car dropping him from contention in the race. With major championship implications at stake, INDYCAR race control reviewed the incident. Upon the review, there was no penalty issued to the #10 car of Franchitti for the contact (the Versus television broadcast mistakenly announced there was a penalty issued but the decision was reversed). Insult to injury was added to Will Power later on lap 65 when he was shoved by Alex Tagliani's #77 car. Out of the race, the Australian Power had harsh and angry words with both drivers who eventually led him to a second DNF in a row. "I understood he was going to get penalized but then there was no call - I just don't understand that." Will Power said after the race expressing at one point that Dario Franchitti is getting away with several incidents without penalty throughout the season. Commenting about Tagliani, Power called the French-Canadian driver "a wanker". From lap 49, the Honda Indy Toronto was led by the #38 of Graham Rahal who was remaining on track with more worn tires and less ethanol fuel than other contenders. Needing cautions laps to make a legitimate effort to finish the 85-lap distance without an added pit stop, Rahal was aided by the considerable yellow flag periods. Holding off Ryan Hunter-Reay on a lap 61 restart, Rahal was holding on to the lead of a race his father once 25 years before. Ending a race gone bad on lap 72, Alex Tagliani was caught in a turn 3 wreck which involved the #7 car of Danica Patrick and the #18 of James Jakes. Clipping one of the cars, Tagliani's #77 was launched onto two wheels crashing onto the outer race track fence. Despite the scary angle of Tagliani hitting the wall with the top side of his vehicle, the driver was not in danger and got out of the car without injury. Tagliani finished in 23rd place after retiring from the IZOD INDYCAR event. A short-lived restart, their was a lead change as Dario Franchitti's #10 Target Chip Ganassi Racing car passes Graham Rahal to assume the top position. One final full course caution came out on lap 77 following a four-race pile-up through turn 1. Resulting as a chain reaction when the #26 of Marco Andretti touched the #2 car of Oriol Servia, Servia's car whacked Justin Wilson's #22 car. Creating a congested track, James Hinchcliffe and Charlie Kimball made minimum contact with the stopped Servia car. Under the yellow flag, the field diverted around turn 1 while Hinchcliffe and Servia awaited a chance to rejoin the race. The Newman/Haas Racing cars completed the Honda Indy event with notable hometown rookie James Hinchcliffe finishing 14th place. Hinchcliffe would be the highest finishing Canadian driver. On the final restart, Target Chip Ganassi Racing cars of Dario Franchitti and Scott Dixon swept into the top-two spots by the end of the Lakeshore Boulevard stretch. In control of the race, the efforts of the red cars were helped on lap 79 restart lap when Ryan Hunter-Reay collided with Graham Rahal's #38 car. Despite being in the thick of things for the winning the event in the late laps, the #38 Service Central car ended the Honda Indy in 13th place. "It was really frustrating to get hit there at the end, I really thought we were going to have a good finish for the Service Central team" Rahal said following the event. Cruising to victory with only his teammate Scott Dixon venturing an occasional move for the lead, Dario Franchitti take the checkered flag for the 2011 Honda Indy Toronto. Having won his third Honda Indy event, Franchitti also won has 4th event of the 2011 IZOD INDYCAR series season and a 30th American open wheel racing event. "I was pretty happy just be in the company of Rick and J.R., and to get my 30th win today means a lot, especially here in Toronto, I got my first pole here in 1997. I love racing in Canada." Franchitti said in post race. In relationship to the collision with Will Power, Franchitti said after the race he was willing to take more than 50 percent of the blame for the incident but also argued the #12 Penske Racing driver had responsibility for the spin. "We had that incident with Will. He outbraked himself to outbrake me and opened up the door, I went down the inside, I held the wall and Will came down. I put my nose in there, I was trying to get my nose out, but ultimately he closed the door and paid the price." With Scott Dixon taking a runner-up position, Andretti Autosport drivers Ryan Hunter-Reay and Marco Andretti put in a great showing at a track their team owner Michael Andretti won 7-times at through his driving career. Rebounding from his own troubles in the race, Vitor Meira brought his AJ Foyt-owned car to a top-five finish in Toronto. For the 2011 IZOD INDYCAR season, the result for Meira and the #14 team is a best result. A trio of other strong finishes in the Honda Indy Toronto includes Sebastien Bourdais completing the race in 6th place, Simona de Silvestro in 10th in her return to the series and Ana Beatriz who charged from 26th to finish 11th. Beyond the results, the 2011 Honda Indy ended as a hot race accompanied with hot tempers. Whether this sizzling will cool ahead of the next race at Edmonton in two weeks will depend on the drivers. However, for the fans who have witnessed this wild 25th anniversary Honda Indy, it becomes so hard to believe a 1.755-mile circuit could provide such an action-packed weekend.